When Reyes Vado decided his garden’s newly built fence needed an access gate, he bent down and grabbed, of course, his machete. It’s amazing what a machete can do in the hands of an expert like Vado, a typically sweet, wire-framed Nicaraguan who works in a local salt mine. Or the damage this real-life multi-tool might do in the hands of, say, me. During the 2 days I and my Roadmonkey expedition team members helped construct this simple wood-and-wire fence with Vado and other local nicaragüenses — during the volunteer part of our adventure philanthropy expedition to Nicaragua — I came to a deep appreciation of the rusty, decade-old machete’s versatility. Deep enough to make the average gadget-obsessed, Home Depot geek feel awfully like a over-privileged clod. Have tools, will travel: The Roadmonkey fence-building crew with local Nica folks in Las Salinas. Low hanging tree branch blocking your doorway? Chop it down with a machete. Pigs getting in your house and snuffling around in your bed? Scare them out with a machete. Need lumber to build a fence? Hack at a tree limb with your machete until it resembles a post. 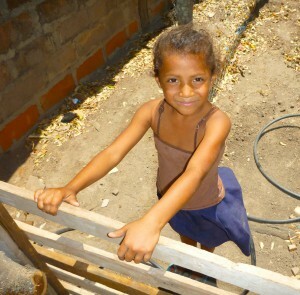 Such was my experience volunteering with Fundacion Aprender, Roadmonkey’s nonprofit partner in Las Salinas, Nicaragua. Yoseiling climbing on the new fence. Part of me wondered why I was even volunteering there; clearly all these people needed were raw materials and generations-old Nicaraguan ingenuity—they didn’t need a pasty white girl wearing expensive outdoor clothing that probably cost more than the fence materials, gawking at their natural prowess with a $3 utility knife the size of a baseball bat. The fence, funded by me and my expedition members, was needed to allow local families to grow their own fruits and vegetables. Without the fence, gardens aren’t feasible because the plants are devoured by livestock. And in Las Salinas, almost no one can afford to spend the $200 it costs to buy fence-building materials to create their own vegetable gardens. That’s where I and my Roadmonkey team came in. We provided the funding and the hands-on labor to build the fence, and got to know a part of Nicaragua in the process that other travelers never see. You don’t realize what you’ll learn on one of these projects until you’re there, building it, across a language barrier. What I learned is that my presence in this tiny village meant more than a semi-strong back to help dig post holes and spread chicken wire; it reflected the idea that despite our geographical and cultural differences, we are not all that different—just born under different circumstances. That’s one thing I learned from Gabriela Prado, the founder of Fundacion Aprender, who came to Nicaragua in 2004 after living in New York City. Originally from Argentina, Gabriela said she envisioned a simple life teaching yoga at local resorts and writing poetry under the mango trees on the farm she bought in Nicaragua. She quickly became a source of entertainment for local children in Las Salinas who couldn’t afford to attend school. Showing up at all hours, the curious children would knock on Gabriela’s door bearing gifts of eggs and fish in exchange for story time with their new neighbor. Gabriela quickly realized the level of poverty in the village was crippling the children’s chance at an education, thus urging her yogi’s heart into the world of non-profit philanthropy. I and my fellow Roadmonkey volunteers first met Gabriela at the town’s modest library (which she helped build), with her finger stuffed into a bottle of ice water; a scorpion had stung her that morning. She explained that Fundacion Aprender means “foundation to learn” in Spanish, and that her non-profit encompasses more than children’s education initiatives. The organization also sponsors families in need, like Vado’s, donating materials for low cost, sustainable living such as food-bearing plants for gardens, fencing materials, and pasty-white manual labor volunteers like myself. Using broken Spanish, rusty tools, and the ever-enduring machete, I helped Vado’s family plant enough food to significantly reduce their grocery costs. At lunch, the families and volunteers sat down over pineapple juice to exchange introductions. After explaining I was a graduate student, a village girl named Aracely admitted her disappointment at never attending university; like many girls in Nicaragua, she got pregnant instead, and is now a single mom. I was impressed with her similar educational ambitions—and saddened by her circumstances. In another life this motivated girl could have been me; we are the same age. At the end of the project I wanted to give more than a fence, but in Las Salinas, a fence can protect years of free food, and the money saved will help Aracely’s son achieve what she never could: improve his life’s circumstances and one day, attend university. Maya Seaman is a writer with too many hobbies and an insatiable wanderlust. Stay tuned for her upcoming Nicaragua blog post, next week, about learning to surf. This entry was posted in expeditions and tagged adventure, education, Fundacion Aprender, Gabriela Prado, machete, Nicaragua, nutrition, philanthropy, Popoyo, Roadmonkey, surfing, volunteering, voluntourism. Bookmark the permalink. Follow any comments here with the RSS feed for this post. Trackbacks are closed, but you can post a comment.